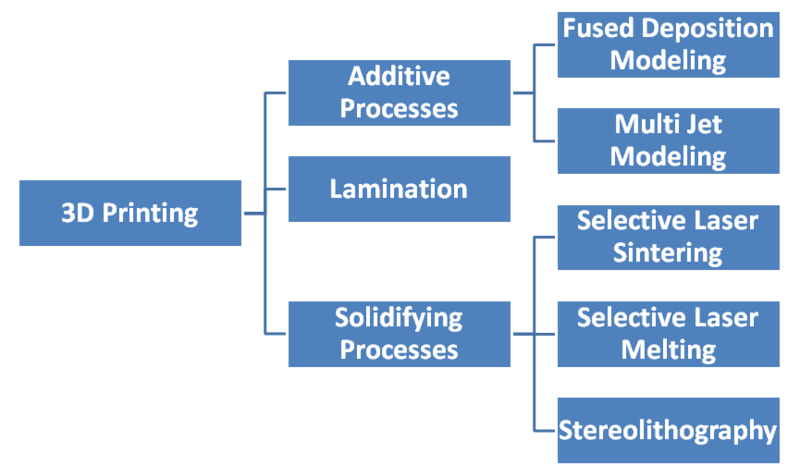 Overview of common 3D printing methods. 3D Printing includes Additive Processes include Fused Deposition Modeling; Multi Jet Modeling; Lamination; Solidifying Processes include Selective Laser Sintering; Selective Laser Melting; Stereolithography. Minor processes and other names for highly similar proceysses like Electron Beam Freeform Fabrication, Direct metal laser sintering, Electron beam melting, Plaster-based 3D printing, and Digital Light Processing are not separately mentioned.